A spiritual medium/paranormal investigator/scam artist is thrown into a real investigation when he discovers that a ghost is killing from beyond the grave. Before Peter Jackson became known for making big-budget fantasy epics like "The Lord of the Rings," "King Kong," and "The Hobbit," he spent much of his early filmmaking career making horror comedies like "Bad Taste," "Dead Alive," and, of course, "The Frighteners." This film stars Michael J. Fox as Frank Bannister, a paranormal investigator, and spiritual medium. A tragic experience many years prior gave Frank the ability to see and speak to the dead. He uses this power in a shady way by having his ghost friends haunt houses so he can be paid to clear them. He seems to be running a decent racket, though he lives in a shabby, unfinished house. All of this changes when he comes face to face with a spirit that is actually killing people from beyond the grave. Now, he has to actually do what he has only been pretending to do up until this point. Joining Fox are Chi McBride, Jim Fyfe, and Jon Astin, who play Frank's ghostly pals, as well as Trini Alvarado, who plays love interest named Lucy Lynskey. For fans of cult classic horror films, Jeffery Combs from the "Re-Animator" series stars here as well, alongside Dee Wallace, who is a horror icon and has appeared in numerous films in the genre. This movie starts off very fun and light in tone, then takes a dark turn part of the way through. 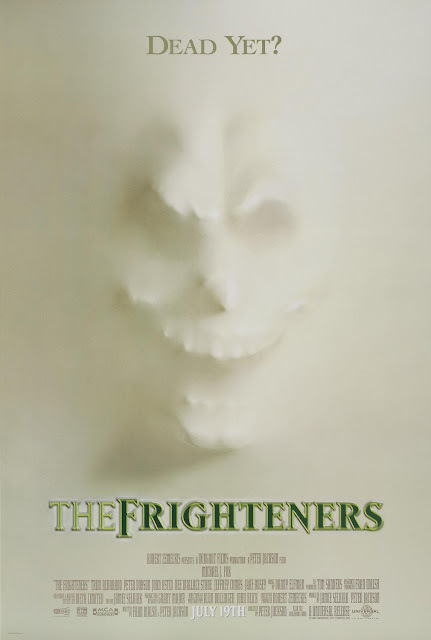 "The Frighteners" is rated R, but watching the first half, we started to wonder why. It almost feels like a goofy ghost comedy that would be fun for the whole family. It is silly and filled with CGI ghosts doing ridiculous stuff, then suddenly, it gets a more horror-focused. By the second half, the mood has totally changed. That's not to say the comedy element is completely gone, but the story becomes far less silly by the latter half and contains much more violent imagery. Michael J. Fox does a great job in his part. It helps that he was a comedy staple in the 80's. He has a pretty solid story to work with that keeps us engaged almost entirely. Jeffery Combs' character, FBI agent Milton Dammers, also offers a lot of funny moments and is a real highlight of the film. Apart from the acting, the CGI is extremely dated. The technology was very new at the time, and it appears, like most children with a new toy, Peter Jackson just wanted to see what he could do with it. Much of what happens here winds up looking super fake and really cheesy in retrospect, especially considering much of what was done could have likely been made more convincingly with practical effects. We are sure "The Frighteners" was groundbreaking at the time, but there is something to be said for knowing your limits and the limits of the technology you are working with. This is a mistake Jackson still makes even today. Just because something can be done with CGI, doesn't mean it necessarily should be, especially if the alternative will look better. Despite its dated visuals, "The Frighteners" is a fairly entertaining ghost feature. It's got a lot of laughs and some good performances. The shift from super silly comedy to downright violent horror midway through its runtime will keep the audience guessing what's yet to come.